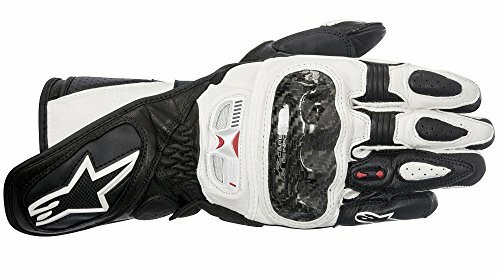 Alpinestars SP-1 V2 Leather Motorcycle Riding / Racing Glove features increased stretch zones, aramid fiber reinforcements and a new, ergonomically profiled knuckle protector. 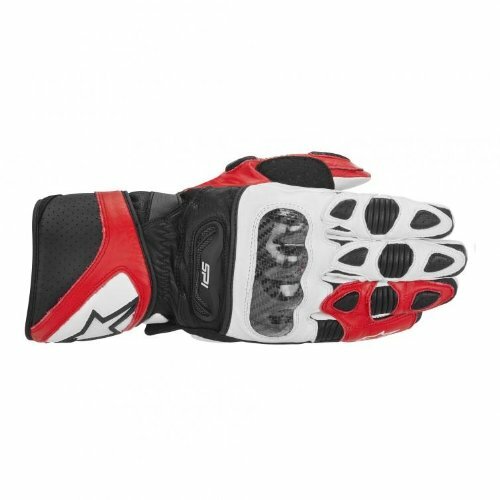 Including the newly developed Alpinestars semi transparent knuckle, and patented finger bridge helps prevent finger roll and separation during crash. 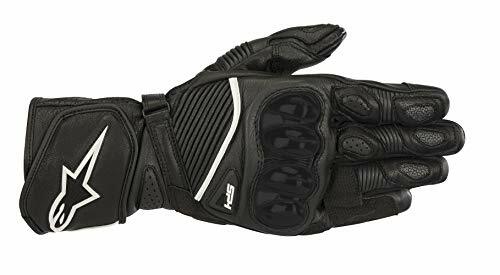 With its aggressive sport racing fit, double wrist closure and reinforced landing zones, the SP-1 V2 leather glove is protective and comfortable while promoting high levels of hand flexibility. Fully constructed from supple and durable full-grain leather. 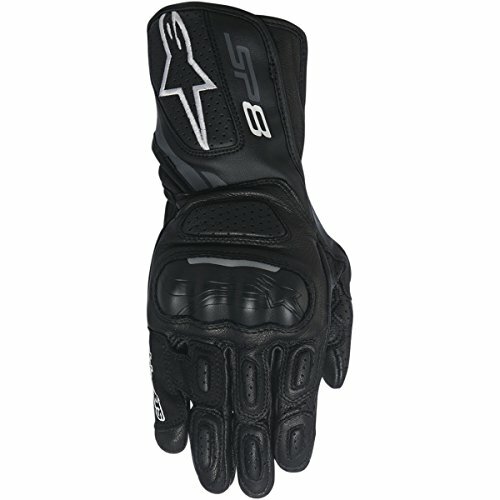 Strong and supple goat leather used for the palm and finger construction for superior durability. Ergonomically profiled carbon fiber knuckle provides exceptional impact and abrasion protection. Patented 3rd/4th finger bridge prevents excessive finger roll and separation during impacts. Palm and outer edge of hand reinforced with suede and leather. Innovative palm rubber patches. Injected TPU palm and finger sliders for superior impact and abrasion resistance. Touchscreen-compatible fingertip on index finger for use of touchscreen devices.. Accordion flex inserts on fingers and outer thumb. Vented backhand for TPR climate control. Strategically-positioned ventilation perforations on finger sidewalls. 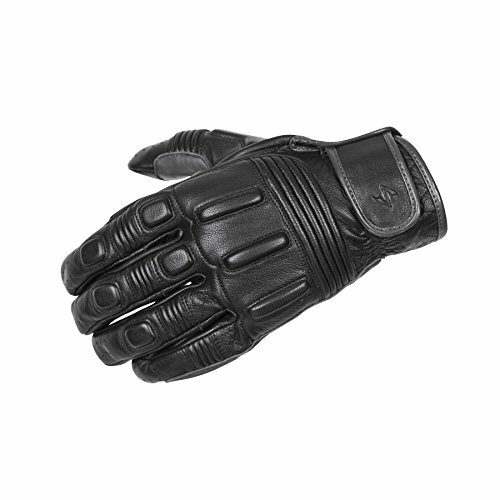 Leather reinforcements cover finger and sidewalls for durability. Thumb, fingers, top of hand and wrist are reinforced with 4mm perforatedfoam padding. 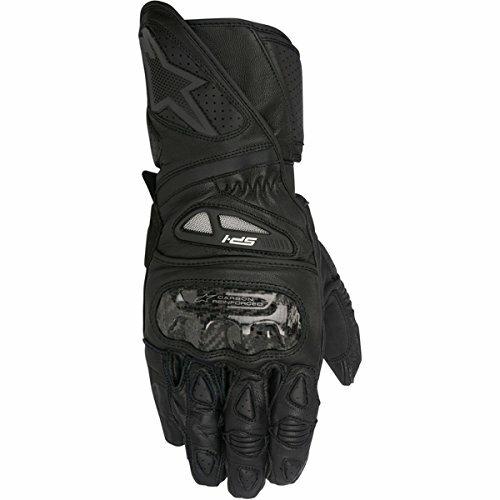 Gauntlet-style cuff includes TPR Astars logo and secure, adjustable dual hook-and-loop closure. Pre-curved finger design reduces fatigue.